Global warming…I’m not sure what that is while winter storm warnings were posted for the Sierra Nevada range over the weekend with snow at 3500 feet. This weekend I had on my golf calendar the Olympic Club Stroke Play on Saturday morning, followed by a 1pm shotgun start to the Santa Clara County at San Jose CC. Last year I played in both on Saturday, shot 72 at OC Ocean and 68 at San Jose CC and chose to return to San Jose CC on Sunday for the final 36 holes (thus needed to withdraw from the OC stroke championship). This year was quite different, as the weather made it quite a challenge as the OC start on Sat was delayed and hour to 9:05 start, making it impossible to play in both until the round got cancelled after 4 holes (it was coming down in buckets). I then drove an hour down to San Jose to tee it up in the Santa Clara County to defend my 2010 title. Honestly I wasn’t very enthusiastic about playing in this event versus the OC Stroke play, as I have a huge dilemma with the OC event (more on that later). So I played the first two holes at 1 under par, and was first up on #3 the par three at the top of the hill playing 184 into a strong wind. 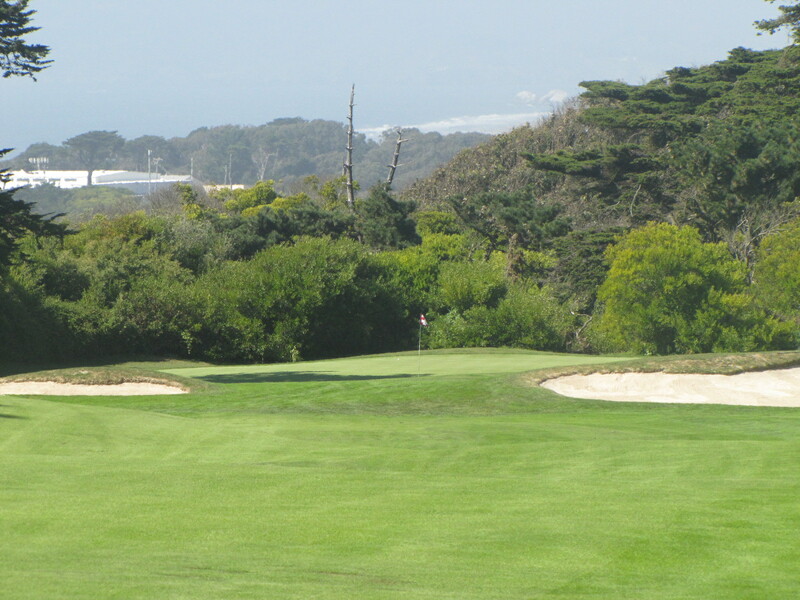 I had my 5 iron out and took a swing that resulted in a HUGE tweak to my back, sending my ball way right…I was done for the day at this point and was hoping I would be okay to play the 18 hole final on Sunday at Olympic Club. This year the reason the OC Stroke was so important is for two major reasons- #1 by winning the OC Stroke, I would be automatically invited to the OC Carr Mara team playing in Ireland in September. Second this year the Crump Cup at Pine Valley conflicts with the start of match play for the Olympic Club Championship in late September. By winning the stroke play, I am exempt from the OC qualifier, allowing me to see if I make the semi-finals of the Crump Cup, which is on the Sunday of the first match at OC. If you were able to follow that I congratulate you!!! Many think I’m a bit nutty about all the events I race off too, and try to play in crossover events like these. But it’s what I LOVE to do!!! My round at OC Lake on Sunday started off with a booming drive on #1 followed by several poor shots in a row. After a par saver on #2 of 20 feet, I made a bogey at #3 to go one over on the round. Now a bit concerned, I sucked it up and started to hit some better shots leading to birdies at holes 5,7,8,11,16 and 18 for a 67 and 7 shot victory over my pal and defending champ Mark Mance. It was one of those days were you don’t have your best ball striking stuff but the putter was keeping me in the round until I figured out the ball striking which happened on about #8 when I hit a 5 iron on this tough uphill par three that almost went into the hole (about 1 inch from going in). The game of golf is rarely played when everything is clicking perfect, during a round you NEED to make adjustments and stay positive. This was a helpful round leading up to the start of the California State Amateur at the Olympic Club in 14 days. Today I meet with head fitness trainer at the Olympic downtown club, Rebecca Roberson. I already know she is going to torture me with very tough exercises that will make me very sore over the next few days. I will be sharing these torturous exercises with you, and my new diet, all geared to give me every possible chance to play well in this important event, and then the British Senior Open (a major) in July which I’m exempted into through my low amateur finish last year at Carnoustie. Congrats Randy. When the going gets tough, it helps for one to have the tenacity of a Cougar. Good luck in the Cal Am. Randy, looking forward to the nutrition/fitness posts. See you in a couple weeks at O Club.